A keen sailor for all of his life, Vasco Buonpensiere has always been yachting fan who left his career as a lawyer to follow his passion. His first job in the working industry was at Waterman Exclusive Yacht Services in St. Tropez, where he worked as a broker and European sales agent for Royal Denship. The brokerage arena was not fulfilling Vasco’s needs and ambitions, therefore, as soon as a shipyard called him to become a sales manager, he went back to Italy: his first job in a shipyard was in the sales office at CRN-Ferretti Group. After a few months, he became Sales and Marketing Director of both CRN and Custom Line. He left CRN in 2010 as Brand Manager and Sales and Marketing Director, after having sold 58 vessels from 30 to 80 mt. 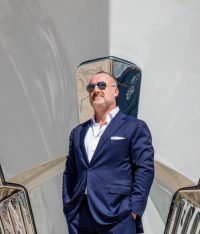 In 2010 (the worst year ever for the yachting industry) he co-founded Cantiere delle Marche where he is Member of the Board as Sales and Marketing Director. In five years, CdM became an absolute market leader, having sold an average of one boat every three months and representing 60% of its relevant niche. Today, after 8 years from its inception, CdM still maintains absolute leadership in its segment. Vasco has also been member of the board at the International Superyacht Society and has been key speaker in many of conferences around the world.